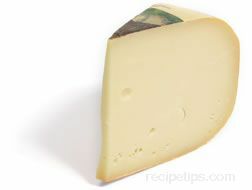 Allgauer Emmentaler is a German cow's milk cheese that is much like Swiss Emmental. 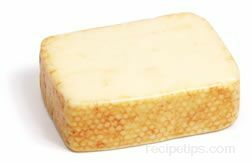 It is characterized by large holes throughout the cheese and a texture that is somewhat hard. The flavor is rich and slightly sweet. The cheese is often served as a snack or used for sandwiches and for cooking. Bruder Basil is a cow's milk cheese from Germany. 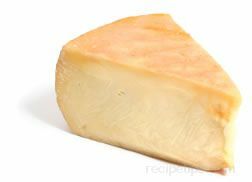 It has a firm texture and a dark brownish colored natural rind. The cheese is pale yellow and contains very small random holes throughout. The flavor is rich with a slight smokiness. It is produced in small brick shapes that are covered with wax. Bruder Basil is excellent for grilling and for serving on sandwiches, and it is often served simply as a snack or an appetizer. A cheese native to Germany and Austria, Cambozola is basically a combination of Camembert cheese and Gorgonzola cheese, thus the name, which also can be spelled, Cambazola. 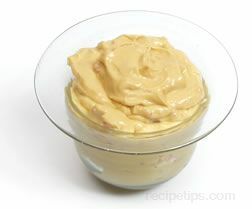 Soft and spreadable, Cambozola is made from cow's milk with cream added, which forms a cheese that is rich and creamy. The smooth interior contains a few blue veins running throughout, which gives the otherwise mild and somewhat mellow flavor of the cheese a hint of spiciness. The exterior of the cheese is coated with an outer white mold during production. Considered to be a type of blue-brie cheese, Cambozola is well suited for salads and appetizers. It is often served with sliced meats and sausages. It can be also added to sauces as a flavorful touch. When served as is, Cambozola should be allowed to reach room temperature to achieve its optimum flavor. The term, Farmstead Cheeses, refers to cheeses made with milk collected from a group of farms that are located within close proximity to where the cheese is produced. Typically, the owners of the farms raise their animals on similar grasses, in similar areas, and with similar methods to produce the milk that is used in the production of the cheese. A similar term often associated with European cheeses is farmhouse cheese,referring to cheeses produced in lower volumes and made on individual farms that are situated in valleys, mountainous areas, or the meadowlands of Europe. Limburger cheese was first produced by the Trappist monks in Belgium in the early 18th century. Today, Limburger is produced throughout the world, but it is most often found in the U.K., U.S., and Germany-especially Germany, where it is so popular that it is often thought of as a cheese of German origin. 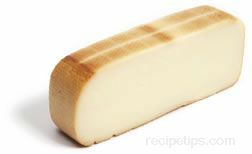 Limburger is a cow's milk cheese produced in wheels, blocks, or wedges of cheese. Covered with a thin edible rind that is light ivory to reddish brown in color, the paste of the Limburger cheese is white, smoothly textured, and sharp or salty tasting. Limburger cheese is soft-ripened for three to four months using coryneform bacteria. The bacteria combine with the acids in the cheese to produce molecules that contribute significantly in providing Limburger with its most famous characteristic—its pungent aroma. Most often, Limburger cheese goes well with hearty meats; robust red wines or dark beers; and earthy brown breads, such as rye or heavy wheat breads. It may also be combined with crackers, fruits, raw onions, salty fish, and nuts when served as an appetizer. 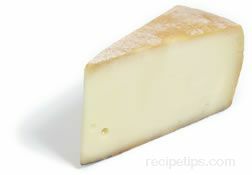 Munster is a cheese native to Germany and France and is produced from cow's milk. It is formed into a round block of smooth semi-soft textured cheese. 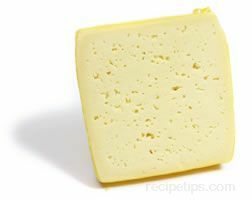 Most Munster is produced using pasteurized milk; however, when it is produced as a farm cheese, unpasteurized milk is used. The sticky rind of the cheese has a yellow-orange color that is derived from repeated brine washings over a two to three month period of aging. The mature cheese has a yellow color, a strong aroma, and a distinctively spicy or tangy taste, which is attributed to the brine washings. The younger aged cheese has a mild flavor. A similar cheese produced in North America is referred to as Muenster. It has the same texture as European Munster, but is white in color and has a mild, light flavor. There are variations of Munster cheese made in other countries as well, such as in France where Chaumes, Gerome, Lingot d'Or, and Marcillat are produced. Munster is served as an appetizer, as a complement to dark bread or baked potatoes, and as a cheese to use when grilling foods. Beverages that go well with Munster cheese are beer, Gewurtztraminer wine, and full bodied red wines. Munster can be frozen to keep for extended periods of time. 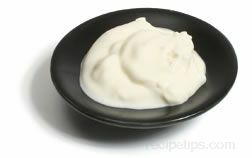 Quark is a type of fresh cheese produced in Germany, the United Kingdom, Holland, and any other countries. It is similar to strained yogurt in both flavor and texture; however, some versions of this cheese are produced as curds while others may be smooth and free of the lumps of the small curds. The cheese gets its name from the German word for curd,which is "quark." Tilsit is a German cheese made from cow's milk and is considered to be a semi-hard factory cheese. It is made into a wheel that has a thin off-white or almost yellow crusty rind. The interior, filled with tiny holes, is smooth and soft and has a buttery flavor that may be slightly fruity in taste. Tilsit is a good cheese for snacking or appetizers. 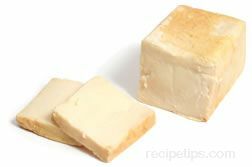 It also has good melting properties, which allows it to be used as a grilling or baking cheese.